An armed domestic abuser ignored a court order to turn his guns over to police, and in December 2017 two Bremerton officers nearly paid for that with their lives. The incident serves as an example of the dangers of not enforcing weapons surrender orders. Investigators in Kitsap County have closed the books on a 2017 shooting that left two Bremerton police officers wounded and the gunman dead. The events leading up to December 17, 2017 are a textbook example of the dangers posed by domestic abusers who have access to firearms. Thirty-three days before the shootout at Lions Park in Bremerton, a Kitsap County Superior Court judge filed an order requiring Willie McCord to surrender his firearms to police. McCord did not comply, leaving him in possession of two guns he used to unleash a two-handed barrage aimed Bremerton officers Kent Mayfield and Allan McComas. In Washington and many other states, a person who is subject to a domestic violence restraining order is required to surrender their firearms to authorities. This is done, because years of experience by law enforcement shows that victims are in the greatest danger when they are leaving their abusers, and that’s why it’s important that weapons surrender orders must be enforced immediately. A KING 5 investigation found a large percentage of accused domestic abusers ignore weapons surrender orders issued by courts across Washington, including the Kitsap County Superior Court. Instead, the subjects of surrender orders fail to respond at all. Only recently did the Kitsap court start taking steps to improve enforcement of those orders. McCord was required to surrender his guns after he beat his wife and engaged in a physical altercation with responding police officers during a November 2017 domestic violence call at his Bremerton home. Police seized one rifle that evening, and they took the Navy veteran to jail. McCord was released on bail and ordered to stay away from his wife and home. A few days later, McCord’s wife called Bremerton police to report that McCord had additional firearms stashed somewhere. “Willie had threatened her with a .357” handgun in the past, according to a written police report documenting the wife’s call. There’s no evidence in McCord’s court file that the court contacted police about the fact that McCord had been ordered to surrender his weapons after the November incident. But Bremerton police officers were keenly aware of the potential threat because of McCord’s repeated violation of no-contact orders obtained by his wife. That knowledge is what led Officer Mayfield to question McCord as McCord sat in his silver SUV at Lion’s Park, one block away from his estranged wife’s house. As Mayfield prepared to arrest McCord, the second arriving officer, McComas, noticed a silver handgun inside the driver’s side door pocket of McCord’s vehicle. A scuffle ensued, and according to investigative documents, McCord emerged from his SUV firing with pistols in each hand, including a .357. McCord fired 20 rounds, wounding both officers before he was killed by their return fire. An independent investigation concluded the use of lethal force by the officers was justified. McCord’s case shows how police and the public can also be endangered by an armed abuser. Frank Maiocco, the administrator of Kitsap County Superior Court, says he has made a procedural change since KING 5’s original story about the lack of enforcement of weapons surrender orders in the county. He has started notifying the sheriff’s office of cases in which respondents to weapons surrender orders openly defy the order. It’s not a perfect system, but Maiocco said he has reported a handful of potential violators. A KING 5 story in May revealed that 80 percent of accused abusers did not respond to weapons surrender orders filed in Kitsap County Court. Maiocco says that number is alarming, but there are important caveats. For instance, that number includes surrender orders issued in cases where a victim filed for a protection order but never followed up with the court. Even after the protection order expires, it stays in the system. Maiocco says it remains an active surrender order but is likely unenforceable. In King County, where the Regional Firearms Enforcement Unit was formed last year to seize abusers’ guns, team members say that victims are often afraid to report firearms to authorities for fear of further agitating their abuser. That’s why King County’s system has police, prosecutors, and victim advocates who specifically focus on firearms in domestic violence and extreme risk cases. Kitsap County Sheriff’s Office also acted in one recent case. Devin Smith, 31, of Port Orchard has pleaded not guilty to making a false or misleading statement to a public servant and failure to surrender a weapon in Kitsap County District Court. 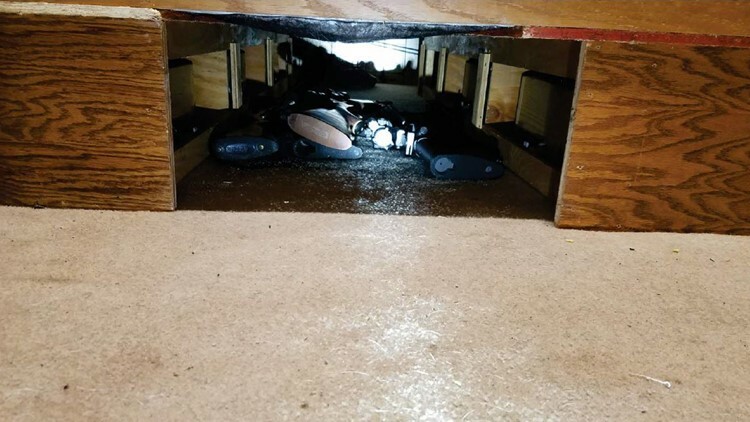 A deputy arrested Smith on September 9 after his girlfriend reported that she had found a stash of his guns hidden under the bed in the home they previously shared. Smith had previously told authorities he did not have any guns, according to documents in a domestic violence case filed by his girlfriend, who claimed Smith threatened her with his firearms. “It was just a misunderstanding that hopefully we will get taken care of,” Smith said as he left his court arraignment in early November. The sheriff’s report says Smith admitted that he lied about still having possession of firearms. In McCord’s case, his escalating behavior brought him to the police department’s attention independent of a notification from the court about the weapons surrender order. “If we would have known where he was or found him, we would have definitely arrested him,” said Bremerton Police Lt. Aaron Elton. He said McCord was living out of his SUV after being served with the no-contact order that kept him from going near his residence or his wife. Elton says the department isn’t sure what it could have done differently to disarm McCord before that fateful night last December.